Hello, Toulouse the Moose here! Hello, Toulouse the Moose fans. I am here with Menou and Etienne who shared many years in our local paper. We are trying out a new venue and would appreciate you letting us know what you would like to see and hear from us the most. Please, click on Contact Us where you can indicate what your interests are. When you are visiting the website you will meet some of my other friends in storybooks that take you on special adventures. The storybooks are located under the OUR SHOP tab. 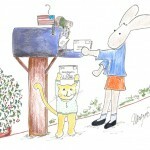 This entry was posted in Toulouse the Moose Message and tagged children's storybooks, moose on June 25, 2012 by .